"Just left the best place to stay in Point Pleasant Beach, what a great vacation! Wireless Internet Access in our Lobby, Patio Areas. 1/2 off daily ride tickets, Atlantic Club Access, Discounted daily parking & beach passes, barbeque access, are all included as part of our Resort Package. subject to availability. Great Adventure Call for details and six flags new jersey packages. Jenkinsons Aquarium for your next Party. Unique Theme and setting for a memorable Moment. Excellent Service and Accommodations at the Amethyst. Transportation Services Available. All Year Long and Point Pleasant Beach go together. Amethyst NJBeach Resorts offers packaged weekends, group trips and excursions. 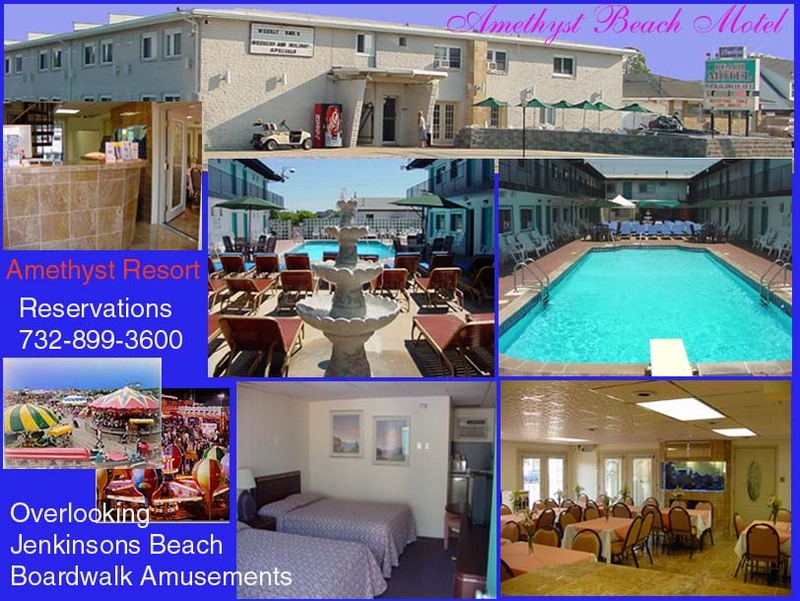 Amethyst's NJBeach Resorts offers Volley Ball and Barbeques, Shuttle Transportation to and from selected attractions. Hospitality Partners Jenkinsons Family Boardwalk & Aquarium, Six Flags Great Adventures and the Atlantic Club can provide the setting for a most memorable party. Amethyst�s Beach Motel welcomes the opportunity to serve you this summer. 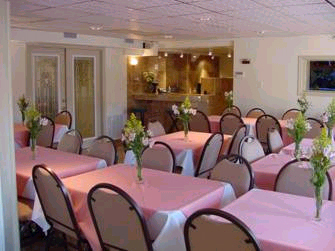 We are sure you will find our point pleasant beach motels and staff to be the finest. The location is the best of any motel in Point Pleasant Beach, overlooking Jenkinson Boardwalk, Beach, Amusement Area, and directly across from Silver Lake Park and Point Beach Band Shell. We are only 20 miles from Six Flags New Jersey, Hurricane Harbor, Great Adventure. Six Flags Great Adventure opens early spring and offer a wide variety of rides and exhibits. Six Flags Great Adventure has partnered with Amethyst to offer value packages. You can find additional information on the Six Flags Great Adventure site. Our Motel Offers rooms with optional King Size Accommodations, and for your convenience and comfort, all rooms have small refrigerators. Microwaves available upon request at no extra charge. Smoking is not allowed in any guest rooms. For Families vacationing for extended periods especially when visiting Six Flags New Jersey you may choose to consider an Efficiency that would allow for light cooking. Apartments and Suites are also available for weekly, monthly and seasonal rentals, complete with daily maid service and private patios. Our apartments are limited and seem to be this years favorite since there are not many summer rentals which include daily maid service, private patios with heated pools as well as private parking, continental breakfast all of the additional amenities of a hotel guests. Every morning we serve a complimentary continental breakfast which is served poolside in our patio. Our pool is heated and our patio offers much sunshine as well shaded area throughout the day. Weekdays our guests have access to our picnic area where they can barbecue, play volleyball, as well as other out door activities. We hope to offer canoeing this summer in Silver Lake and will have more information as the season progresses. Tuesdays is Wristband Day at Jenkinson's Amusement Park where children can ride for one price between the hours of 12 � 5PM. Thursday night Concert at the Band Shell Across the Street followed by Jenkinsons spectacular Firework Show can be seen beautifully right from our facility. Sunday night is Movies on the Beach at Jenkinsons Beach. Nightly Entertainment is within walking distance. Dancing to Live Bands and DJs at Jenkinson's www.Jenksclub.com, Under the Stars at Martell�s Tiki Bar www.tikibar.com or Dockside @ Clarks landing www.clarksbarandgrill.com and do not forget Six Flags New Jersey each fall hold Fright Fest. Please look for us under motel point pleasant or motels point pleasant beach when searching the web. For additional point pleasant motels, point pleasant information look at the lodging page on the njbeach.com directories.